Our good family friend, Mrs. Regan, asked me to make a few batches of assorted decorated sugar cookies to send out as Christmas Presents. I was very excited to do some more Xmas cookies and so happy that she thought of me for the order! 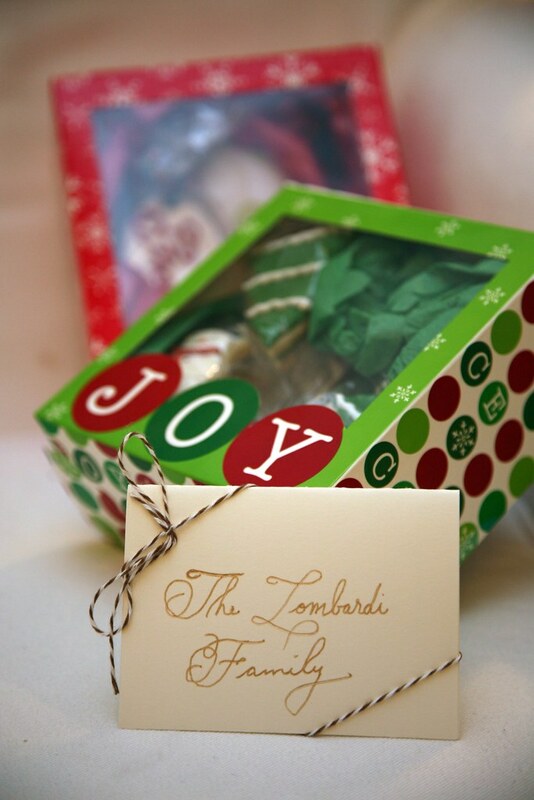 I packaged up the 1 1/2 dozen cookies in two boxes per package with a little gift card. Since the packages were going to families with young kids, I did a wintery assortment of snowmen, reindeer, snowy christmas trees and snowflakes. 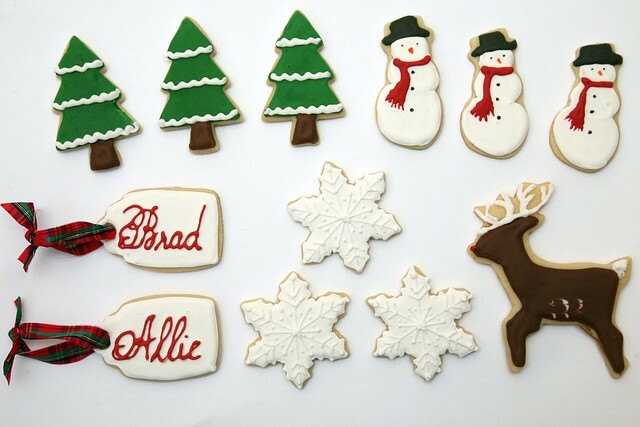 I made a gift tag cookie for each of the kids with their name piped in red script. 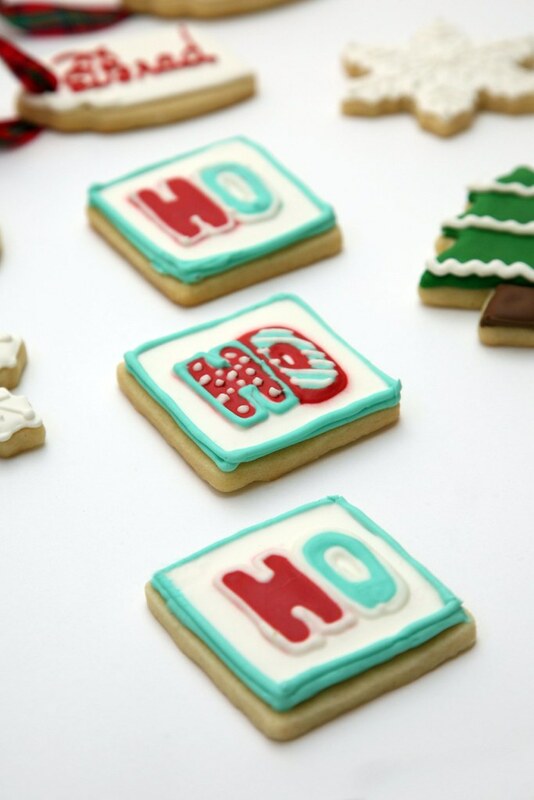 I liked they way the gift tag cookies came out. They had that fancy, old-fashioned feel to them. Like the kind of gift tag that might come from the North Pole. Maybe even specifically the North Pole depicted in the movie The Santa Clause. I threw in some Ho Ho Ho's for good measure. I love a little blue thrown into the standard christmas colors, like this holiday card shown below from Paper Crave. It really appeals to me for some reason. 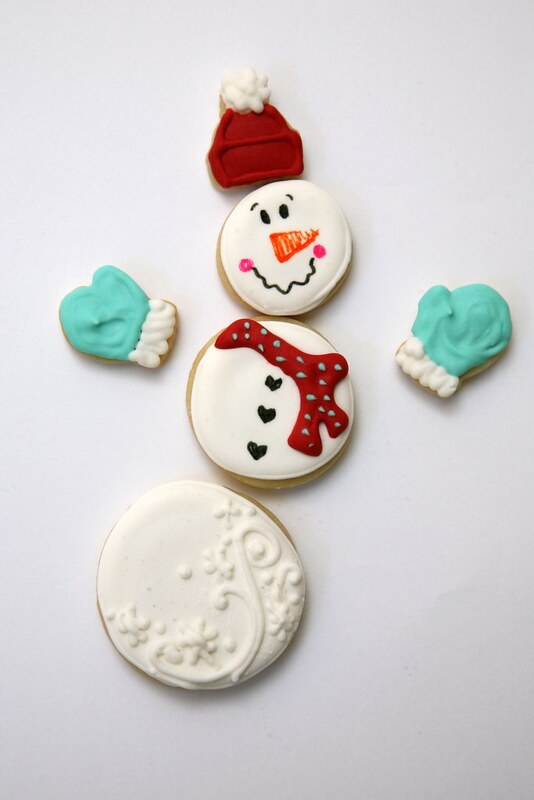 And finally, in the spirit of playing with your food, I included one segmented snowman cookie in each package so the kids could build their own snowman. I completely copied this cookie directly from the Segmented Christmas Collection created by the very talented Judy of East Coast Cookies, who I found through Sweet Sugar Belle's dancing elf cookie post. I just thought the idea was adorable and clever and had to try it out. I gave my snowman a little snow hat to match his mittens, but everything else was straight up Judy's design. I didn't want to change it... I loved everything about it! Hope the packages were well received!